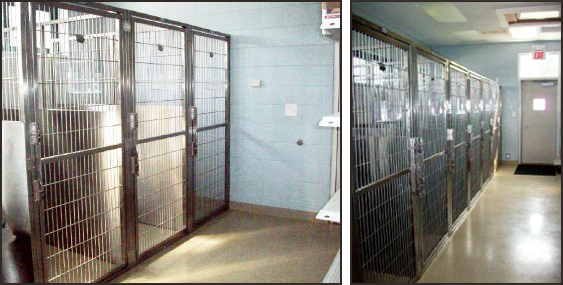 Our large boarding facility can accommodate any size dog with tender loving care. Put your mind at ease while you’re away by boarding your pet in an environment that emphasizes safety and cleanliness. We offer a choice of housing to accommodate all sizes and personalities, or pamper your dog in our Luxury Boarding Suites: Boarding so luxurious you’ll want to switch places with your dog! Full-size, cozy bed, fluffy rugs, TV, DVD player, natural lighting, and more. Our outdoor, grassy play yard provides a safe place for your dog to experience supervised, one-on-one playtime with one of our caring kennel attendants. Your cat will love a room with a view in our “Cats Only” boarding area. We offer spacious condos with outside window views to satisfy a cat’s natural curiosity. And your special kitty will be purrfectly happy in our kitty playroom, equipped with a fun cat “tree” to climb and window perch on which to fall asleep while watching the birds at the bird feeder outside the playroom window. All runs are 3 feet x 6 feet, completely indoors, and have central heat and air. Luxury suites are 6 feet x 6 feet, have fluffy rugs, doggies beds, and cable TV with DVD player. Sizes vary, but your cat will be placed in the largest cage available. Condos are in a room in the front of the building, with a window view, separate litter box, and bedroom areas for each condo, and with the option of having more than one condo open for the kitty who prefers more living space.